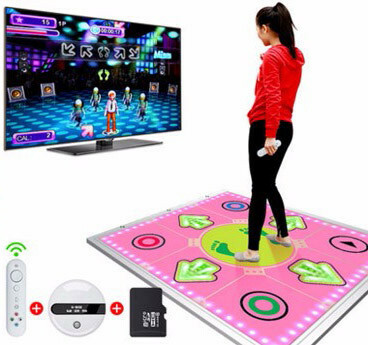 The Champion Metal Dance Pad features the super-sensitive-definitely-no-more-delay technology with our brand new look and offers Four-in-One multi-platform plug that works flawlessly with the PS One, PS2, Wii / GameCube, Xbox, and PC via USB. The Champion Metal Dance Pad features raised and step-n-lightup arrow buttons that accurately recreate the look and feel of an arcade platform, and they let you know exactly where you are on the pad at all times. From complete novices to experienced experts, you can now experience skill levels that can match your abilities. 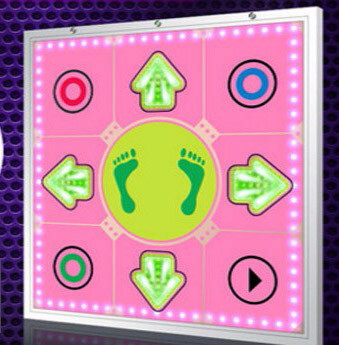 Whether you are competing against the challenges of the game or you are seeking particular opponents to match your wits and dexterity, the Champion Metal Dance Pad will provide you with a completely new and rich experience. · Dimension of sensor plate: 6" x 5 3/4"
· Dimension of each arrow: 1/8" x 10 3/4" x 10 3/4"
· Dimension of metal platform: 33 7/8" x 33 7/8" x 1 1/4"
· Play Area: 32" x 32"